Sunday Pinning: Cozy reading nooks. So this week on Pinterest, I found myself drifting into the cozy reading nooks. Maybe it’s the cold weather fast approaching or losing daylight savings time. 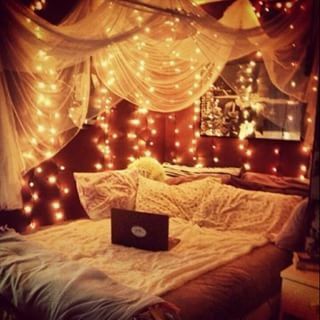 Either way, the idea of curling up in any one of these nooks with a book, fills me with the warm and fuzzies. So what makes a reading nook cozy? For me, it breaks down into 3 reasons, sometimes 4. The first and most important requirement? Mood lighting. Ah yes, candles, twinkle lights, or in the case above, lanterns. Low lighting may not always be conducive for reading, but it is essential in finding the balance so you feel cozy and relaxed. 2. Your cozy nook must include soft cuddle-able material such as blankets and/or pillows. Preferably both. In my opinion, a pair of pillows and fleece blanket can transform most any space into a perfect reading nook. There is nothing better than your feet being tangled in a blanket, getting lost in a book. 3. Speaking of feet, mine have to be up. Wether they are propped up on an ottoman, or curled up underneath me, in order to consider myself in a cozy position, my feet have to be up in some way. Now, I know this is technical and I’m getting very obsessive about this, but there are several things I take very seriously and being warm and happy are two of them. The only exception to my feet being up rule, is if I’m swinging. If I’m in a swing, like the one pictured below, I can totally over look my feet touching the ground. Reading nooks for nature lovers pin. The above pin still checks most of our boxes: mood lighting and soft material. Plus, it opens the door for our 4th bonus box that is much harder to check, a gorgeous view. Now, the above reading nook checks off every box on our list, including our bonus one. It’s difficult to achieve the “nook” feel with a view because most nooks are in little corners, tucked away. But on the rare occasion, like the one above, you can tuck yourself away into a corner of windows and still stare off into the beauty around you while mulling over your fantasy book’s plot. Do you have a favorite spot to read? What is most important for you in a cozy reading nook? When I was a kid and teenager, I loved to read. Obviously I didn’t enjoy all the school assigned reading, but I loved to read fantasy and romance and all the seemingly unattainable things of my youth. But getting married young, having special needs kids, and attempting to find my career path; I managed to forget that I enjoyed reading. There were WAY too many things that needed my attention and money: changing diapers, therapies, work, sleep, actual clothes (not pajamas) and the occasional date with my husband. Then one day, in my later twenties, I picked up a book y’all may have heard of . . . Twilight. Suddenly, my mind and imagination sparked in a way it hadn’t in years, and I remembered I loved to read. How much I’d missed the magic, escape, and all the imaginary worlds beyond this one. Lately, I’ve been thinking a lot about the kind of writer/storyteller I want to be. Who is my ideal reader? Who do I want to focus my marketing towards? Who are the people who I want to actually read The Door Keeper? Jordan is mom with two kids, a husband, and a career she enjoys. She is busy juggling a lot, but on a vacation, she read The Door Keeper and it reminded her how much she enjoyed reading. I want this series to be that kind of series. I want to be that kind of author. I want to be that fun, easy, whimsical read that reminds you how good it feels to pick up and get lost a book. How wonderful it is to be taken on an adventure outside of your own life, and explore other worlds. I want to reignite the imagination we had when we were younger, before real life overwhelmed us with chores, obligations, and work. That is who I want to read this story. That is who I want to write for. Do you know someone like that? Are you them? Well, then THIS was written for you. Please share this post with your friends and if you’ve read the book already, give it to a friend to borrow who may need reminding they love to read. Help me spark our imaginations, reengage our minds, and reignite our passion for reading, because Jordan is right: It’s good for the soul.